2. Seoul & Hongdae(Hong-ik university area) map, we provide for free. 3. Each room has its own bathroom, refrigerator, washing machine, air-conditioner, hair dryer, free wifi. 4. We have 40 newly built clean rooms, so it is convenient for making the group booking. We are always open for Pencil guests. Hong-dae Pencil Guesthouse & Hostel is a quiet, relaxed and secure hostel close to the metro, making it ideal for families and couples. They offer bike rental as well as a wide range of free facilities including laundry, Wi-Fi and hairdryers. Hostelworld guests have told us that 'the private set-up of the rooms makes for a comfortable stay for those wishing to have a little more privacy and freedom on their trips'. Just 1 minute walk from Hong-ik Univ. (Hong-dae) subway and Airport Railroad Train Station Exit No.3 to Pencil Guesthouse in Seoul. Pencil's room, it's Modern & Clean, En-suite style. All rooms have 32 inch big screen TV, Fridge, Air-conditioner and high speed wifi is possible. Recommendable rooms for couple, family and friends with their own private room. 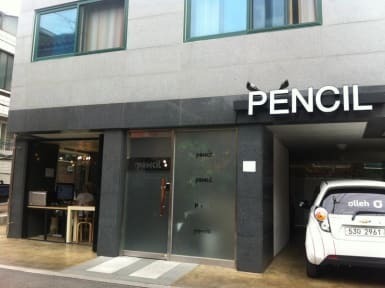 Pencil Guesthouse was opened at the end of year 2012 near Hongik University area - which is the hottest spot in Seoul. For a long stay or a short stay, here is the perfect place. Clean and calm but very close to the busy cosmopolitan street. * If cancelled or modified before 28 days prior arrival date, no fee will be charged. * If cancelled or modified in between 22 to 28 days prior arrival date, 1st night will be charged. * If cancelled or modified 14 days prior to arrival or in case of no-show, 100 percent of the total balance will be charged. Only child below 3 years old stays for free on existing bed. For 4 years and above, extra bed should be used and is chargeable. The girls who worked reception were really friendly and invited me to eat lunch with them. I felt welcomed and they even suggested a few places to explore in Seoul. I always will come here to stay when in Seoul. The location is perfect and I can alwags trust that the hostel will well facilitated and clean. Perfect location, very friendly staff, very safe, very clean, staff speaks English quite well - felt at home there! Would definitely come back. Not a place to meet other people of my age though. Mostly (very friendly) Koreans visiting. Still, if you don't want to meet lots of people, go there! Very organized, clean and convenient accommodation! I was allowed to store my luggage there even I had checked out. Great stay at a clean, safe, comfortable hostel with very helpful staff. Highly recommend! Great location close to the metro. The private room I stayed in was very clean and comfortable. The common room has basic kitchen facilities and a breakfast is served daily. The coffee isn’t great, but there are many coffee shops nearby. I would definitely stay here again. Friendly & clean hostel. Great location! I like to think that we treat all of our guests like family members, with informative and friendly travel tips. We even have our own Hongdae map! We share everything here in order to make you feel at home. There's lots of extras such as towels, clean bed sheets, breakfast, free lockers, free laundry, free bicycle rental and even a free South Korea guide book. We even prepare special traditional Korean meals sometimes! We recommend that people explore the Hongdae area around us, it's a big area for clubs, cafes and BBQs. I think we're ideally suited for first-time visitors to Seoul, since we've got easy access to the airports. Most of our guests are aged between 20 and 30.